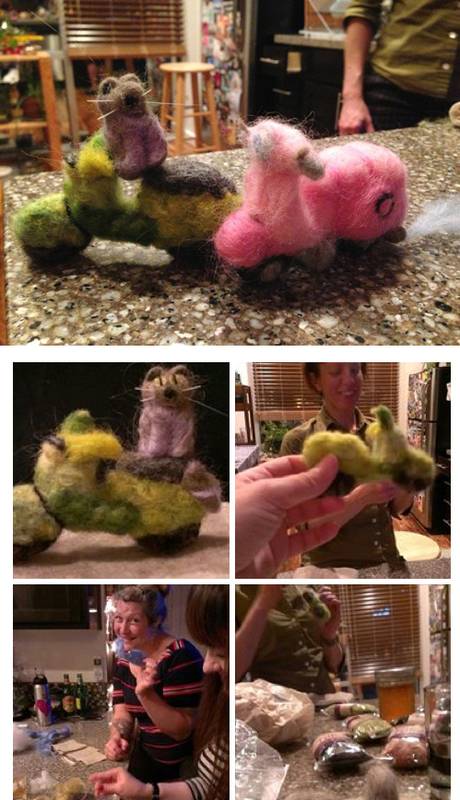 So the Cute Bunnies and Kitties Scooter Club had a craft night recently and we made (or in my case attempted to make) some felted scooters like the pink one Nicole made. ScooterSwag’s regular contributor Cassie was an overachiever. Not only did she make a scooter in about an hour’s time but added a kitty rider made from hair she brushed off her cats and some whiskers she had saved. I was still trying to get a basic scooter shape after about two hours time and sorta added one tire. Curious what’s involved in felting? Here’s a video showing the basics. This entry was posted in Crafts, Decor, Fabric, Models, Figurines, Toys and tagged Crafts, felted, felting, needle, roving, scooter, vespa by Tracy. Bookmark the permalink.